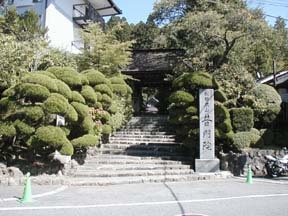 Temple Lodging in Japan "Fumon-in"
The garden is said to be the work of Enshu Kobori. Although small, its scenery is said to be the best on Mount Koya due to its excellent picture painting method. The five rooms on the second floor facing this garden have twin beds, an elevator, the latest style private restroom with air conditioning, double-pane window glasses, power sunshades and a LAN environment. Thus, the rooms are blessed with powerful tools to produce relaxation. This shukubo enables you to fully enjoy the sacred place with history and tranquility through facilities that will completely change the image of "shukubo being equivalent to Japanese-style rooms."